If, like me, you have given up on Family Guy, you probably didn’t bother to watch the Nov. 20 episode. The show has become really repetitive and juvenile. They even managed to F up Star Wars–their Return of the Jedi episode, “It’s a Trap,” was terrible. Here is a good article from 2009 about the show’s decline. When I heard about the premise for the latest episode, however, I had to check it out on Hulu. In “Back to the Pilot,” Stewie and Brian–in my opinion, the show’s only still tolerable characters–travel back in time to the night the pilot takes place. The impetus for their trip is pretty weak; Brian wants to find a particular tennis ball he buried in the yard. But the idea of revisiting the show’s origins opens up a lot of possibilities for self-referential jokes as well as some of the sci-fi subject matter that Seth MacFarlane and company have tinkered with a few times before. 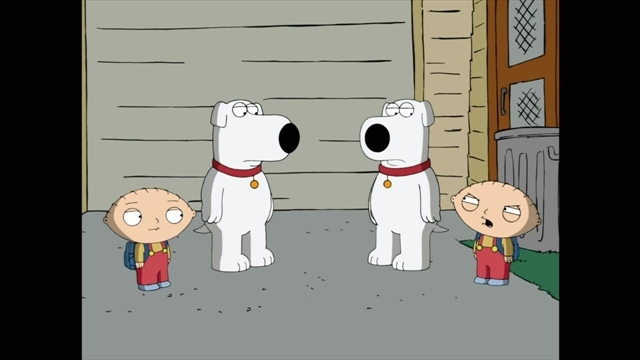 The first scene of Stewie and Brian in the past, watching the action of the pilot through the kitchen window is packed with jokes, from the fact that Meg was voiced by a different actress (Lacey Chabert) to what happens on the “set” during cut-aways. As the episode progresses, it winds up making fun of the show itself more so than the pilot episode. In the pilot, “Death Has a Shadow,” Peter goes to work with a hangover and loses his job, then defrauds the welfare system. “Back to the Pilot” has a few intersections with that storyline–the funniest bit is when the Kool-Aid guy misses his entrance–but the two plot lines don’t actually affect each other. “Back to the Pilot” instead takes off on its own time travel story, asking the taboo question, “Would we be worse off if 9/11 had not happened?” At one point, there is actually a vote taken on whether 9/11 should happen or not. This is the kind of edginess we miss from the early days while we now suffer through fart jokes and spoofs of How I Met Your Mother. There are a couple of bits of good dialogue, and Cyborg Joe is awesome. I don’t feel like the concept fully lived up to its potential, but the episode is still the most creative thing the show has done in years. This entry was posted in 1990s, 2010s, About Pilots, Animation, Comedies and tagged family guy, pilots, seth macfarlane by meekthegeek. Bookmark the permalink.